British-born writer and director Eran Creevy broke onto the scene with the BAFTA-nominated crime thriller Shifty. His follow-up Welcome To The Punch, however, provides him with a better canvass to showcase his skills and, despite an overriding sense that style has been favoured over substance, proves to be a decent success, particularly in showing how much can be achieved on a slim budget. When a heist involving his son goes awry in London, former criminal Jacob Sternwood (Mark Strong) is forced out of his Icelandic hideout. 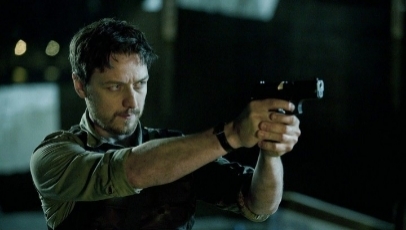 For detective Max Lewinsky (James McAvoy), this means another opportunity to catch the man he’s been chasing for years. Working against his lieutenant with the help of partner Sarah (Andrea Riseborough), Max soon finds himself embroiled in a larger conspiracy. At it’s heart, Welcome To The Punch is a stripped-back and occasionally punchy cat and mouse thriller, with Max as the dedicated cop and Jacob as the devious crook. It’s relatively easy-to-follow as each side do their bit and the equilibrium is continuously alternated, though Creevy does clutter the screenplay further down the line as it becomes increasingly difficult to follow who’s on whose side. The problem is, the narrative is almost too straight, with nothing to set it apart from other films of its ilk. Thankfully, Creevy’s sleek and stylish directorial style diverts attention away from the inconsistencies embedded within his script and onto the vivid London locations (the polished buildings juxtapose brilliantly against the rough-and-tumble) and the well-executed action sequences. Like the resourceful surface detail, Welcome To The Punch also provides a decent showcase for its acting talent. McAvoy and Strong exercise themselves well, while Riseborough provides solid support, even if her role is underwritten. Peter Mullan pops up, too, and involves himself in a humourous living room shoot-out. It all amounts to what’s a reasonably potent, yet ultimately ineffectual film.